Finally, the reprint of Schnappchen Jagd is here! Valley Games is excited to have this title now printing.This a very anticipated reprint of the popular German game by Uwe Rosenberg (Agricola, Le Havre, At the Gates of Loyang). Even better, everyone loves getting a bargain on this junk. But a true bargain is when you get more than your money’s worth. More often than not, though, items we think will be valuable simply are trash. You must decide which items will keep their value and not become worthless. But remember, the more popular a bargain, the much harder it is to find. BARGAIN HUNTER is a trick-taking game where TRUMP COLOR (if any) is determined during each TRICK. 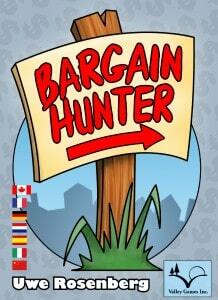 Players try to collect ITEMS and get the best BARGAIN they can on those ITEMS. All other “odds and ends” collected in the process are not necessarily BARGAINS as they may simply remain JUNK over the course of the game. All BARGAINS are worth positive points while JUNK is worth negative points. Each ROUND, however, players have the opportunity to turn potential JUNK back into BARGAINS. Whoever collects the most BARGAINS with the least JUNK, wins.